Imagine hotels or a theater, some entertainment options, and more — a hub of activity — on what’s now barren land. Picture expanded horse racing and a fully operational Long Island Rail Road station. And then, the centerpiece: a new home for the New York Islanders — a new arena built for major league hockey, from the ice and sight lines to suites, restaurants and amenities. Imagine the potential future of Belmont Park. It’s just a seed of an idea right now, but the possibility of something better at Belmont, which sits along the Queens-Nassau County border, is certainly tempting. Four years ago, the state began the process of developing 36 acres at Belmont. State officials issued a request for proposals, and four developers submitted ideas to produce jobs and economic activity, from a soccer stadium to supermarkets. Then . . . nothing. Earlier this month, news came that one bidder, the New York Cosmos soccer team, was in financial trouble. Last week, the state canceled the request for proposals altogether. The delay has wasted time, money and plenty of economic potential. But now the state has a chance to start anew, to make Belmont and land around it a success story. With creative planning, the state could achieve long-out-of-reach goals: improved public transportation, modernization of the racetrack and new jobs and activity. There’s a real possibility that the catalyst to such a plan would be a move from Brooklyn for the Islanders, who are only in their second year at the Barclays Center. But we’re a long way off from that puck drop, and the potential consequences have to be considered, including the impact on surrounding communities and what it would mean for Nassau Coliseum, due to reopen in April. At Belmont, it could jump-start the effort to rebuild the LIRR station for year-round use. The aging wooden structure is open only on race days, but more activity, especially from an arena, would create the need for a fully operational station. Development at Belmont should subsidize it. Finally, there’s the New York Racing Association, whose financial future is uncertain. NYRA, which runs the track and leases some land at and around Belmont, would benefit from new development, but it must prioritize the needs of the local community. 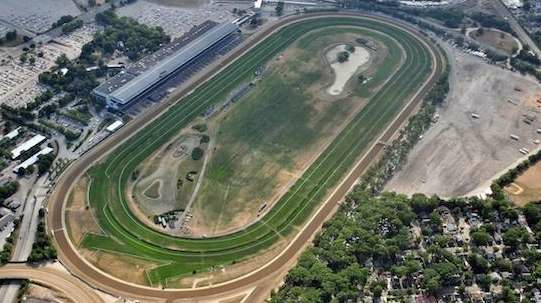 There’s also the possibility of winterizing Belmont’s track so that horse racing could move to Belmont from Aqueduct in Ozone Park, allowing Aqueduct to expand its casino. That might add another party to the table — Genting New York LLC, which operates the video machines at Aqueduct. Could Genting play a role in or help fund development at Belmont in exchange for something more at Aqueduct? As these ideas percolate, where does the state go from here? Importantly, state officials say that they don’t think another request for proposals is legally required, although they note that legislation in Albany might be necessary. Everyone has to get it straight from the start. State officials have to be thoughtful and do this right. If that includes an arena for the Islanders, it could be a win for all. But other ideas should receive full consideration. The state has to make the most of this. Belmont Park is a jewel, and it and the area around it can return to the track’s former splendor. It’s time to transform the barren land and lost potential into a grander reality to push Belmont Park and the entire region into the winner’s circle.